a multiple column layout with a main content body, and one or more sidebar columns to insert lists or other sidebar widgets on. 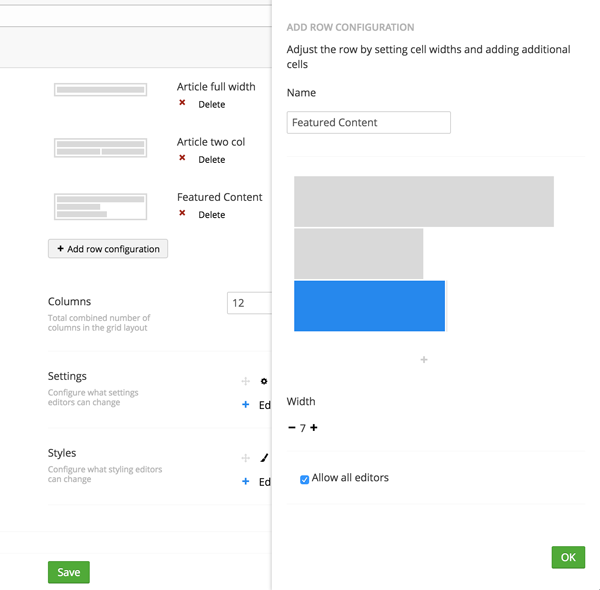 You can however configure as many layouts and layout sections as you wish, each section in the layout must be given a width in columns, so editors gets an accurate preview of their layout. 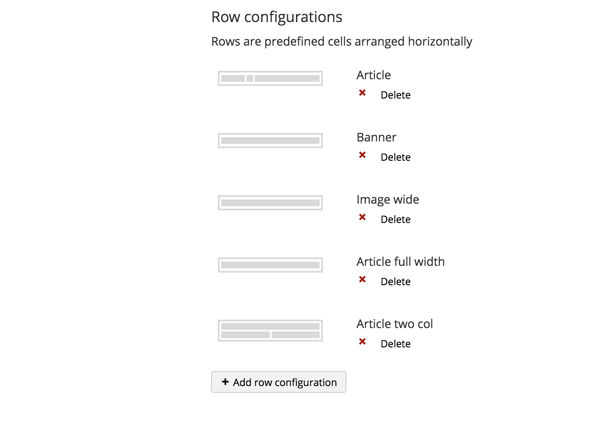 A row in the grid editor contains one or more cells, which divide the row into areas where editors can enter content. So a row is merely a container of areas to insert content into. When you add a new row, you are asked to give it a name, then define cells inside the row by clicking the "+" icon. Each cell has a default width set to 4, but by clicking the inserted cell you can control its width. It is possible to setup configurable attributes(class, rel, href) and inline styling on rows. You can add as many cells as you like. If they overflow the total width of the row, they will simply be arranged after each other horizontally as you'd expect in a grid system. Each cell can by default contain any type of editor such as simple textstring editors, imagespicker, embedded media or Umbraco macros. To override this behavior, uncheck the allow all editors option and you can specify which editors will be available for the row.